Materials: Gold-plated brass. Crystal glass rods. Bakelite sockets. Manufacturer: Bakalowits & Sohne. Today Bakalowits Licht Design GmbH, Gumpendorfer Straße 32, 1060 Vienna, Austria. Other versions: Bakalowits produced several chandeliers and other lamps in this style with those glass rods/tubes. You can find another one here on Vintageinfo. 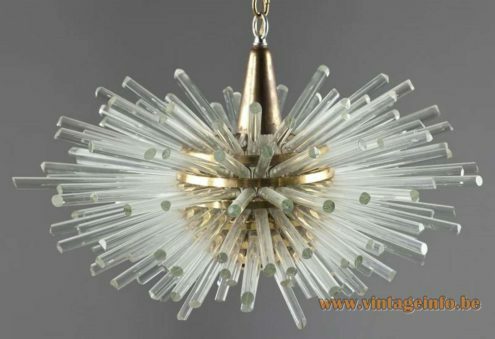 The Bakalowits company was founded in 1845 by Elias Bakalowits and they create stunning lights. Bakalowits is responsible for the biggest chandelier ever built. They did it for the parliament building in Belgrade, Yugoslavia, today Serbia. The company has remained family owned since 1845 and is managed in fifth generation by CEO KR Prof. Friedl Bakalowits.